One story of Olympic-sized courage is one you may not have heard of yet. Fifteen-year-old Lauren James, of Timonium, Md., had Olympic dreams and the chops to make her dream a reality. Back in April, Lauren qualified for the Olympic trials in the 200-meter backstroke – the same event that Missy Franklin set a new world record in during the 2012 games in London – but Lauren didn’t get the chance race with Missy. Lauren earned her first Olympic trial cut for the 200-meter backstroke in March, but in April, her hopes of Olympic glory began to fracture. Just after she earned a spot at the trials, Lauren, an otherwise healthy teen, began to experience headaches. The headaches crept in during swimming practice and they grew progressively worse until Lauren was experiencing a headache around the clock. With the headaches taking over, Lauren struggled to stay in the pool. “It was really hard and it just like completely took over my mind,” said Lauren. Lauren’s mother tried everything to find out what was wrong with her daughter. “We took her to physical therapy, to a chiropractor, an orthopaedist, we did x-rays, we went to the pediatrician several times, and her symptoms got progressively worse,” said Toni. Toni even took her daughter to see Dewi-Frances T. Depositario-Cabacar, MD, a neurologist at Children’s National Health System. With her mystery illness far from solved, Lauren accepted an invite to the Olympic Training Center in Colorado. Now experiencing symptoms of blurred vision and dizzy spells even when she was sitting still, it was time for Lauren to pack her swimsuit and return home. Lauren returned to the DC-area and to Children’s National, where Toni emphasized that the symptoms appeared to be most severe when Lauren was swimming. The neurologist made an interesting suggestion: Lauren should see a cardiologist. With a new clue, the pair made an appointment with Gerard Martin, MD, at Children’s Frederick Regional Outpatient Center. Dr. Martin diagnosed Lauren with exercise-induced hypotension. Lauren suffered from low blood pressure, brought on by swimming. “He knew within ten minutes of meeting her, what was wrong with her,” said Toni. Dr. Martin said exercise-induced hypotension usually develops around puberty and is more common in girls. 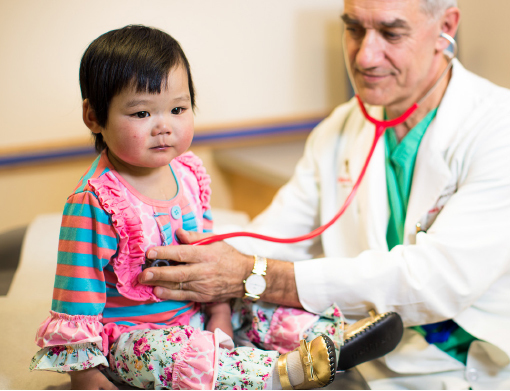 Dr. Martin and the team of pediatric cardiologists at Children’s National treat thousands of kids each year. The team includes experts in all aspects of congenital and preventive cardiology, from prenatal diagnosis to adult congenital heart disease. “For that long time, I didn’t know what was wrong with me. I just wanted to get back to swimming and I couldn’t because my coach told me not to swim until I had two days without a headache and just I couldn’t do that,” said Lauren. The family was so happy with the results Dr. Martin gave them. With just two weeks to prepare for the Olympic trials, Lauren immediately jumped back into the pool she had been avoiding completely for a month. Unfortunately, her absence had taken a toll on her strength and she did not qualify for the Olympic team. “[The Olympic trials were] a great time, a great experience. She met all kinds of Olympians. And although she didn’t swim her best, she was able to go because we met Dr. Martin, and he was able to figure out so quickly what was wrong with her,” said Toni. Lauren still has Olympic aspirations and is working every day to swim faster and to work toward earning more Olympic cuts and is forever thankful for Dr. Martin’s help. “I’m hoping to get faster every day and see where I get in four years,” said Lauren.